Fulbeck was sited three miles west of Fulbeck village between Felton and Stragglethorpe. The area was first used in 1940 as a grass-surfaced Relief Landing Ground (RLG) for aircraft from Cranwell operating from Barkston Heath. It was developed into a Class ‘A’ bomber airfield for 5 Group during 1942. In October that year, 5 Group Air Bomber Training Flight arrived, although it would prove to be December 1942 before the airfield was deemed to be operational. However, no front-line squadrons were allocated to the station and it reverted back to Cranwell for night flight training. A further RAF training unit arrived in May 1943, 1506 Blind Approach Training (BAT) Flight, which stayed until August 1943 when Fulbeck was transferred to the Americans, becoming Station 488. The airfield was initially used by the 434th Troop Carrier Group (TCG) who arrived 7 October 1943, later replaced by 422nd TCG arriving between 27-29 March 1944. On 11 September, the 440th TCG arrived from Exeter to take part in Operation Market Garden. The airfield was returned to the RAF towards the end of September 1944 and reallocated to 5 Group. On 16 October, 49 Squadron arrived from Fiskerton with their Lancasters, to be joined on the 2nd November by 189 Squadron, formed at Bardney on 15 October. Both squadrons left Fulbeck in April 1945, 189 Squadron to Bardney on 8 April followed by 49 Squadron to Syerston, Nottinghamshire 22 April. Following the end of the war Fulbeck was retained as an active station, initially involved with equipment disposal and latterly, as a relief landing ground for Cranwell, until closure in 1970. Most of the perimeter track still exists as do parts of the runways. The dispersed communal and accommodation sites were located to the east, along Fulbeck road and some of these still remain. 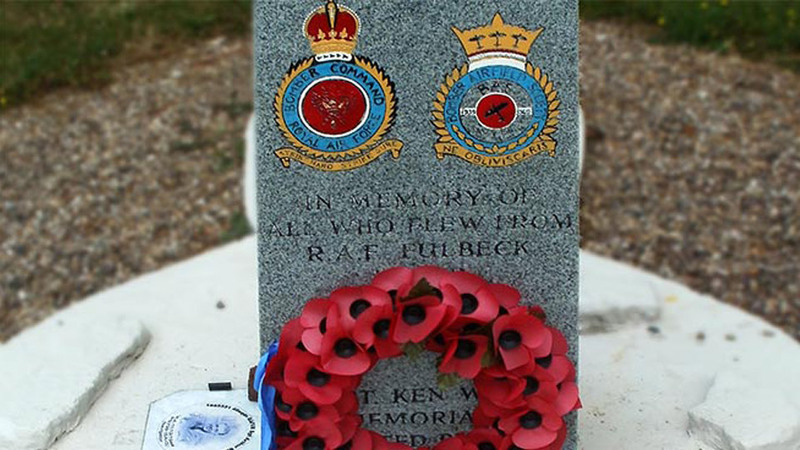 Outside the former main entrance there is a memorial to ‘All Who Flew From RAF Fulbeck’, erected in 1988.